In large mixing bowl, whisk together flour, brown sugar, baking powder, coco powder, and salt. Add coconut milk, water, oil, peppermint oil, and vanilla. Stir until just combined, careful to not over mix. Heat large skillet over medium low heat. Brush with oil Add 1/4 cup scoop of batter to pan and slightly smooth out. Flip pancake when golden brown on underside and can easily be lifted, about 2 minutes. Continue to cook on other side. Repeat with remaining pancake batter. Serve warm. Make the coffee in the coffee maker, but be sure to make it extra strong. Heat the nondairy milk (I like this best with cashew milk, I feel like it is incredibly creamy!) on the stove. Be sure just to warm it, not to have it boiling. Melt the vegan dark chocolate chips in the microwave or on the stove. Combine this with your warm nondairy milk. Mix in your coffee and peppermint oil, and combine all of this into a blender. The blender will make a delicious latte. 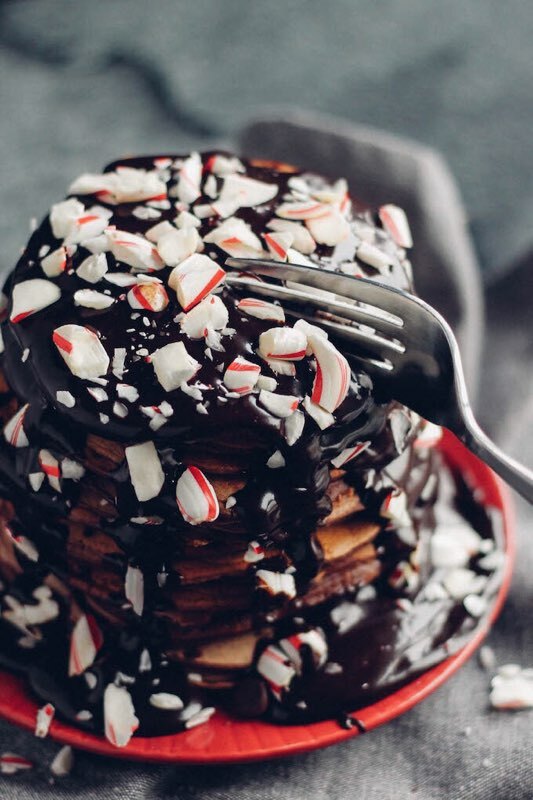 Top with your whip (this is optional) and crushed peppermint candy (also optional).